Bixby, can you hear me? 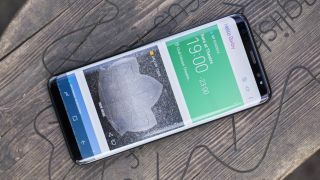 Bixby on the Samsung Galaxy S8 and Samsung Galaxy S8 Plus is about to finally become more useful, as reports state it will gain its much-needed voice capabilities in late June. Samsung first showed us Bixby, its promising, new virtual assistant that’s set to take on the likes of Siri and the Google Assistant, on the S8 when it launched a few months ago. But there was a problem: it debuted without voice-recognizing capabilities, setting it far behind the competition from the start. It wasn’t a good look, especially since there’s a hardware button dedicated to activating it right on the brand new phones. According to The Wall Street Journal, Bixby’s lack of voice recognition at launch stems from its struggle to “comprehend English syntax and grammar,” something that its competitors have years’ worth of data to work from. However, Samsung’s team seems to have cracked the code and the update will begin to arrive in the 'coming weeks'. The brand needs the voice element of its virtual assistant to be a success after the other elements - Vision especially - failed to impress in a world where Google, Apple and Amazon are steaming ahead with impressive AI counterparts.